A true grass-roots movement, the Million Mom March was organized through word of mouth, which makes its impressive turnout all the more admirable. 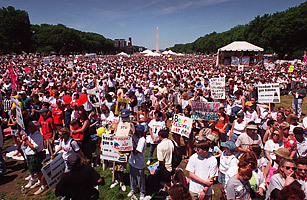 Held on Mother's Day in May 2000, approximately three quarters of a million people showed up on Washington's National Mall to advocate for stricter gun control. Attended by politicians and celebrities, the march also featured a "wall of death," which displayed more than 4,001 names all people who'd been victims of gun violence. Satellite marches cropped up in over 70 other cities, bringing the total number of protesters to about a million.